There are many benefits of almond milk, a non-dairy drink made from ground nuts and water. It is a popular alternative to cow's milk and other milk substitutes due to its taste, nutrition and versatility. People have enjoyed almond milk since the Middle Ages. However, back then, people made the beverage primarily for convenience and taste and likely didn't realize what a nutritional powerhouse they were drinking. Today, almond milk is still consumed for taste and convenience but thanks to modern research, it's also known for its nutrition benefits. Lactose free: Some people are lactose intolerant, meaning they cannot digest lactose, a sugar ingredient found in cow's milk. Almond milk is completely lactose free. Gluten-free: Although cow's milk is considered a gluten-free food, many of the cows producing milk are fed grains that contain gluten, this could still cause problems in people with gluten sensitivity. Almond milk is gluten-free and a great alternative for people who can't tolerate gluten. Cholesterol free: Cow's milk contains varying levels of cholesterol depending on the type (whole, low-fat or skim). In fact, according to UCSF Medical Center, one cup of whole cow's milk contains 33 mg of cholesterol. This is concerning for people on a low cholesterol diet. Almond milk contains no cholesterol and at least one study concluded that almonds can help lower cholesterol. However, keep in mind that drinking almond milk may not offer the same benefits since the study was performed using whole almonds. Low in calories: For people who are counting calories, an eight ounce glass of unsweetened almond milk generally has between thirty and forty calories, depending on the brand. This makes it a great, low calorie option for pouring over cereal or adding to a smoothie. If you're considering using almond milk to help you lose weight, keep in mind that flavored almond milk usually has added sugars and is higher in carbohydrates and calories than unsweetened, plain versions. Contains vitamins and minerals: Almond milk is chock full of beneficial vitamins and minerals. It contains vitamins A, D, and B (riboflavin), as well as calcium, zinc, potassium, magnesium and iron. 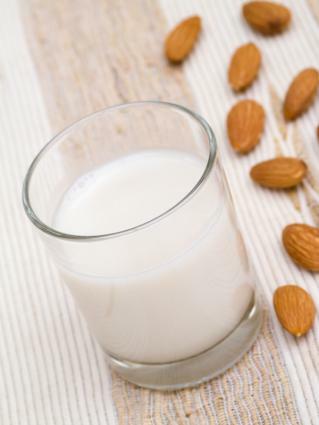 Great taste: Almond milk has a nutty taste and creamy texture that many people love. It comes in a variety of flavors including unsweetened, vanilla, and chocolate blends. Long shelf life: Many almond milk manufacturers offer their products in shelf stable cartons. This gives the milk long shelf life -- up to eight months unopened. This allows you to stock up on almond milk if there's a sale without using valuable refrigerator space. However, once the milk is opened, it needs to be refrigerated. Easy to make: Organic almond milk can be challenging to find at many local grocery stores. But if you're concerned about pesticides, preservatives and other unnatural ingredients, homemade almond milk is surprisingly easy to make. All you need is a little bit of time, a blender and a few common ingredients. Almond milk is a dream ingredient for vegetarian cooks. It can be used as a substitute for cow's milk in mashed potatoes, soups, salad dressings or batters. It's delicious in smoothies and milkshakes or poured over fresh fruit or oatmeal. Silk brand offers a great selection of recipes that use almond milk, many of them vegetarian. Almond milk is also an adequate source of protein, especially for vegetarians struggling to add meatless protein to their diets. Almond milk is enjoying a surge in popularity for many reasons. Once thought of as only an option for vegetarians who avoid dairy products, it now appeals to people from all walks of life -- from lactose-intolerant people trying to calm an unhappy gut to health conscious people looking for nutritious options, or people who just want to enjoy a delicious drink. When you use almond milk or serve it to your family, you can be confident you're making a healthy, nutritious choice. Please note that almond milk should never be consumed by anyone who currently has or has ever had nut allergies.